Home UncategorizedSWDTP Alumnus Dr Abi Dymond wins ESRC Impact Prize! SWDTP Alumnus Dr Abi Dymond wins ESRC Impact Prize! 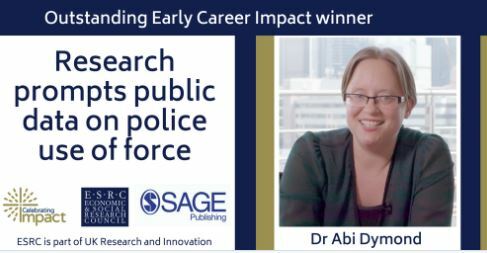 Such brilliant news this afternoon that Exeter based SWDTP alumnus Dr Abi Dymond won the Outstanding Early Career Impact Prize at the ESRC Celebrating Impact Awards 2018. We of course are very proud of Abi and all that she has achieved and you can watch a short film and read all about her work with police forces across England and Wales that has led to a new national reporting system on the use of force – improving transparency, accountability and police practices. Congratulations Abi from all in the SWDTP!